The Durango has long been a favorite for SUV drivers and passengers thanks to its impressive power, loaded interior and great style. The 2018 Dodge Durango SRT focuses on power and performance with a powerful HEMI V8 engine and optimized performance upgrades. The Durango SRT offers a towing capability of 8,700 pounds, and with a top speed of 180 mph, its the fastest SUV available today. With three rows of seating and a host of cargo space, the Durango SRT is the perfect family vehicle. With the rear seats folded, you'll have up to 84.5 cubic feet of cargo space. You'll never have to leave anyone or anything behind ever again! And just because the Durango is optimized for performance, it doesn't mean Dodge forgot about fuel efficiency. The Durango SRT offers an EPA-estimated 19 highway miles per gallon. 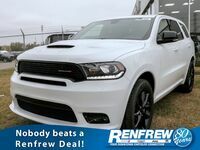 Schedule a test drive of the 2018 Dodge Durango SRT at Renfrew Chrysler of Calgary, AB! This Durango is optimized for performance and power! The 2018 Dodge Durango SRT comes equipped with a 392-cubic inch, 6.4-liter HEMI V8 engine that boasts 475 horsepower and 470 pound-feet of torque. The powerful engine of the Durango SRT offers an amazing 0 to 60 mph time of just 4.4 seconds. The HEMI V8 engine is paired with a TorqueFlite eight-speed automatic transmission. The transmission optimizes efficiently and maps torque to all four wheels. The Durango SRT includes an all-new seven mode drive system, including Auto, Sport, Track, Snow, Tow, Valet and ECO driving modes.Additional performance features and upgrades include a new suspension, Brembo brakes and all-season tires. Also included on the 2018 Durango SRT is a host of safety features, including 4-Wheel Traction Control, Electronic Stability Control, Enhanced Accident Response System, Hill Start Assist, Parksense Front and Rear Park Assist with Stop, ParkView Rear Back-Up Camera and more. The SRT also features Keyless Go™ with remote keyless entry, remote proximity keyless entry and Sentry Key® Theft Deterrent System. 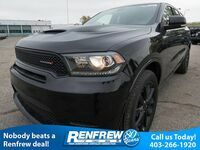 The Durango SRT is fitted with a Beats Premium Audio System with a 506-Watt amplifier that is controlled by a Uconnect 4C NAV system with an 8.4-inch display. Schedule a test drive of the all-new and ultra-powerful 2018 Dodge Durango SRT in Calgary, AB! 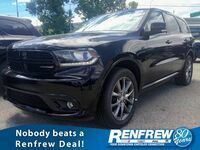 Interested in a Dodge Durango?